Pictured are interpreters at the 2017 Oak Grove Cemetery Walk. 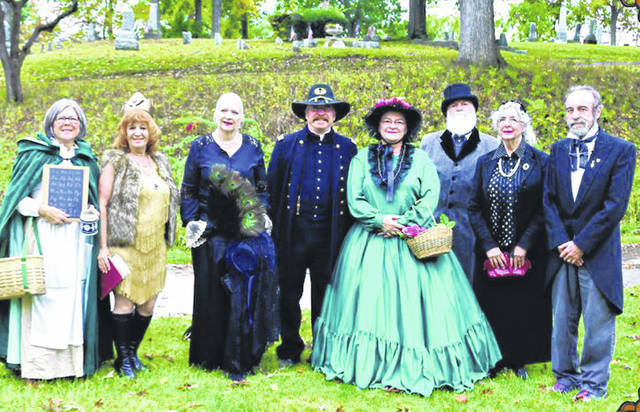 For the second year in a row, history will come alive in the Oak Grove Cemetery in Delaware. On Sunday, Oct. 7, the Delaware County Historical Society will host the second annual Oak Grove Cemetery Walk, in which actors will portray prominent Delawareans who are buried there. This year’s tour will feature a completely new list of historic figures from Delaware, including John D. Van Deman, a former mayor; Frederick Anthoni Sr., founder of one of the first lager beer breweries; and Anne Sanborn Clason, who will tell about her Civil War love story with Captain Marshall Clason. Continuing guided tours will leave every 20 minutes from the front gate of the cemetery at 334 S. Sandusky St. The first tour will start at 2 p.m., while the last tour will start at 4 p.m. Each tour will last approximately 1 hour and 45 minutes. Parking will be available at the cemetery, however, there is no handicapped accessibility, and the tour will involve extensive walking over uneven ground. Participants are requested to be at the cemetery at least 10 minutes before the scheduled time, so the tour group can assemble. This is a ticketed event, $15 for adults, $10 for society members, and $5 for children ages 6-17. In addition, this year the DCHS is offering a free pass for the cemetery walk with the purchase of a DCHS membership ($25). Registration can be done online at Eventbrite.com (“Oak Grove Cemetery Walk-2018”) or mail a check with your name, address, phone number, and “Oak Grove” on the memo line, to DCHS, 2690 Stratford Road, Delaware, OH 43015. In case of rain, participants will be notified by 1 p.m. that the walk has been postponed by one week and will be held on Oct. 14 instead.